Food — The Hungry Gypsy: A Personal, Health, Food and Travel Blog. Is a Gluten Allergy Just a Fad? Having a gluten allergy or sensitivity has become trendy. So much so that is has become fodder for comedians. It causes said bandwagoner to dial back their refined carbohydrate consumption since most processed grains contain gluten. Removing processed junk is always a good thing and can definitely result in weight loss if those foods are not simply replaced with gluten-free versions of the same vein. Said bandwagoner turns out to actually have an underlying sensitivity to gluten that has caused symptoms for a long time (e.g. gas, bloating, skin irritations, inflammation etc.) but because the symptoms were a constant occurrence, he/she never made the connection between food and the symptoms. By removing gluten, these symptoms that he/she had become accustomed to disappear. Simply substituting gluten-free processed crap for gluten-containing processed crap. This does not benefit your health in any way. In fact, some gluten free products have higher glycemic indexes than their gluten-containing counterparts. Some people like to argue that going gluten-free can cause nutrient deficiencies. This is NOT TRUE. Gluten is not a requirement to health. What is true, however, is that grains are often people's main source of B-vitamins and fiber. This doesn't have to be the case, but since Americans (and other western nations) eat A LOT of grains, they tend to be the most prolific source. Be sure to eat a varied whole foods diet focused on vegetables and you will be fine. What about people who DO need to eat gluten-free? Okay, here's the thing. 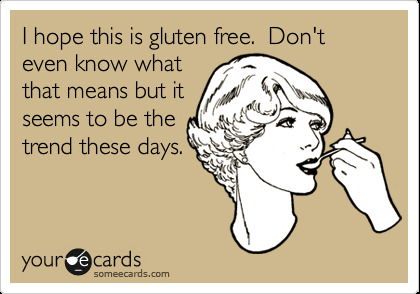 I have noticed recently that some people who truly are allergic to gluten (e.g. Celiac disease, Rheumatoid Arthritis/other autoimmune disorders) or have established sensitivities to gluten are now being accused of having a fake gluten problem. This is not fair. First of all, many people have an allergy to gluten in the true ALLERGY sense: meaning an IgE reaction. That is the definition of an allergy. Other people have different immunoglobulin reactions that are not IgE and those fall under the category of SENSITIVITIES because only IgE reactions are labeled as allergies. Both of these situations are real and neither of these categories of people should be consuming gluten. There is such a thing as a gluten-allergy AND there is such a thing as a gluten-sensitivity. Neither are fake or a fad. People can lie about it, sure, but the diagnosis does exist. The good news is that since gluten-free became a mainstream idea, people who should absolutely not eat gluten have many more options available to them, better labeling, and restaurants now understand what gluten is. That is great. The fact that people roll their eyes at people avoiding gluten is not great. Here is my opinion about what you should do if someone says they are gluten-free. Say OKAY with a smile. Then you have a couple of options. If you are planning a dinner party, inquire "Is there any way that I can accommodate you?" Most people who are gluten-free take it upon themselves to make sure they are taken care of without being a burden. Most likely they will offer to bring a gluten-free dish or have a snack before coming so that they can eat less at the party without going hungry. If you are at a restaurant, inquire "Will you be able to find options here to accommodate you?" Honestly, most restaurants these days are prepared for gluten-free customers. Most likely, your dinning partner will be fine. You can always ask the waiter. If it just randomly came up in conversation, either just say okay with a smile or ask nicely about what caused the shift, how's it going or if he/she has noticed any improvements. No need to be all judgmental, roll your eyes and immediately start fabricating reasons in your mind about all of the supposed "fake" reasons this person has made the choice to go gluten-free. Yes, I realize that some people are just trying to be trendy or trying a new diet for kicks. I realize that if the impetus is on you to cook for a gluten-free individual and you have no idea how to do this, it can be scary and frustrating. Gluten-free cooking, I promise, isn't that hard. But, that is a whole other topic. This post is concerned mainly with those who are not all that affected by their friend's, colleague's, random acquaintance's diet choices. When it doesn't really affect us all that much how someone else eats, don't be rude. This post is really about good people who either have a true gluten issue or want to experiment with gluten-free eating. I'm not talking about people who aggressively inundate you with details of their eating habits when you never asked. You might want to stop hanging out with those people. They sound insufferable. And even more importantly, this post was not referring to people who seem to have a truly unhealthy relationship with their food. Othorexia nervosa is an eating disorder associated with extreme obsessiveness with eating healthy. If the latest manifestation of someone's fixation on healthy eating has come to include gluten-free eating, the previous rules do not apply. Instead, you really ought to entertain the possibility that this person might need some help. Be kind. Always be kind and point this person in the direction of someone with the skills to intervene. You get sugar cravings throughout the day or after meals. You get extremely irritable, shaky and/or spacey if you haven't eaten recently. Your diet is full of processed foods and simple carbs. Your blood test from your doctor came back revealing above normal blood glucose and/or Hemoglobin A1C levels. If you said yes to any of the above, you may have blood sugar dysregulation. The bad news is that blood sugar dysregulation can lead to a whole host of issues such as weight gain, depression, hormonal imbalances and diabetes. It may even be a contributing factor to PCOS, infertility and breast cancer in women. 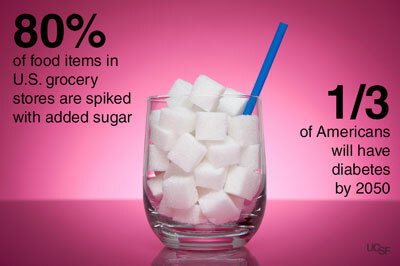 The good news is that blood sugar issues can absolutely be addressed by diet and lifestyle habits. Blood sugar imbalance is one of the few areas where even conventional medicine looks to diet and lifestyle interventions first. What are the 3 main steps to getting blood sugar under control? Those are the basic concepts. Now, let me expand on those ideas a bit and help you understand how to do those three things. I tend to find that my clients have an easier time adjusting their current food intake by focusing on ADDING first, and REMOVING second. Usually, this approach is the most effective and successful. Therefore, in terms of blood sugar management, this means that you want to start my making sure that you are consuming enough healthy fats, protein and fiber. How to do this? 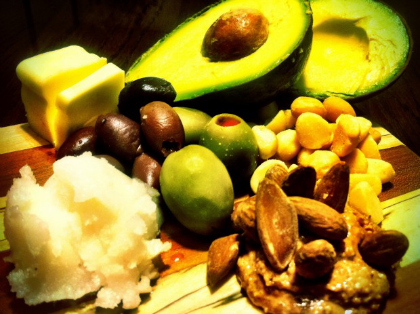 Avocado, Avocado Oil, Olive Oil, Coconut oil, Butter (grassfed), Ghee, Oily Fish, Fish Oil, Flax Oil, Nuts and Seeds. Fat is key. Thanks to the 1980's people are fat-fearful, but that really needs to go away now. That was a fad that allowed companies to pump their foods full of salt and sugar, but market them as a health food because they were "low-fat." Terrible. Fat slows down the absorption of carbohydrates, limiting the glucose spike that causes blood sugar highs and lows, which can lead to diabetes. Not to mention all of the very important fat soluble vitamins that come with healthy fats. BTW-Yes, butter is a healthy fat. The key is to make sure that you are getting a good quality butter- meaning grassfed. It really does change the nutrient profile. KerryGold is a widely available grassfed butter, or any smaller local companies that sell grassfed butter at your local healthfood store or farmer's market is great. Coconut oil (another saturated fat and therefore sometimes demonized) is awesome. It is a medium chain fatty acid, which means it is easily absorbed into the body. It is also a high heat oil so you can cook with it. Please only cook with fats that can take high heat. Low-heat oils will oxidize and become very inflammatory. Not good. It does't have to be animal protein. While quality animal meats (humanely raised, not pumped full of chemicals) can be a healthy source of protein, try also looking toward plant sources such as beans and legumes. They also have the added benefit of being good sources of Fiber. This is where the classic fruits, vegetables and whole grains enter the picture. (+Beans and legumes.) Not only do these foods contain fiber, but they also contain wonderful vitamins and minerals that help our bodies function. Think the color of the rainbow. While whole grains are good in moderation, try to focus on vegetables more than grains. Not only is exercise good for weight management and cardiovascular health (just to name a couple), but the physical act of contracting your muscles will move glucose (sugar) from your blood stream into your cells WITHOUT the use of insulin. How cool is that?! If you are heading on the path towards diabetes, or have already been diagnosed with diabetes, how important do you think it is to give the insulin in your body a break? VERY that's how important. Since it is the contraction of muscles that is key, strength training really is the golden boy in this scenario. 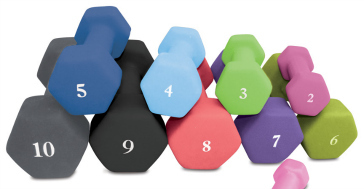 Instead of just hopping on the elliptical, throw in some strength training and you will reap the rewards! I realize that was a crap ton of info, and I still feel like I only scratched the surface. If you have any questions, thoughts, confusions, etc. please leave them in the comments section below and I will answer them/discuss them with you. Help! My Allergy Test Says I'm Allergic to Everything! I've had a couple of clients come to me in a panic saying that they can't eat anything because the food allergy test their doctor ordered came back saying that they are allergic to practically everything. The good news, I reassure them, is that they are not really allergic to everything that popped up on that list. If you have a food allergy test done that comes back identifying a huge number of food culprits, then the real problem is that you have an irritated/inflamed gut lining commonly referred to as leaky gut. The cells that line your gut are called enterocytes. Enterocytes are supposed to be joined together very tightly with "tight junctions" in order to prevent any food particles that are not properly digested from getting absorbed. With leaky gut, the enterocytes have become damaged and spaces are created between the cells that allow for large, undigested proteins to get through. These proteins are identified by the body's immune system as "foreigners" and an immune reaction occurs. This reaction will be identified on your allergy test results as an allergic reaction. Essentially, with leaky gut, the food that you consume can get through those gaps without being properly digested and cause a reaction. Yet, if your gut lining was healthy, those foods wouldn't cause any problem. L-Glutamine is the primary food source for the enterocytes and will help them heal. Broths, both bone and vegetable mineral, are very healing and help to provide critical minerals that may be missing from your diet. For bone broth I use Sally Fallon's recipe, and for a vegetable broth I use Rebecca Katz's Magic Mineral Broth. If you have leaky gut syndrome, your poor gut has been through the ringer. You need the good guys to help you out. The good guys being good gut bacteria known as probiotics. Supplement: Sacchromyces Boulardii is great, or a good quality multi-strain capsule with at least 10 billion per cap. Food: Fermented Foods!! Check out my post on how to ferment. The last step is to reintroduce some foods one at a time. Truly, all of this should be done under the supervision of a health care professional and that is especially true for this step. If you are interested in working with me, please visit my Work With Me page. This step needs to be closely monitored because reactions can sometimes take up to a few days to show up. Also, sometimes a small amount won't cause a reaction, but larger amounts will so that will also need to be evaluated. All in all, leaky gut syndrome is a serious enough condition that you really ought to be under the care of a healthcare professional who can guide you towards healing. The good news is that healing is possible, and since so many issues come back to digestive health, repairing your gut can have a profound improvement upon your life.